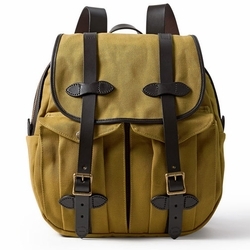 Filson Rucksack. This water-repellent, durable rucksack with roomy interior has Bridle Leather straps, rustproof brass zipper closure and a storm flap for added protection. It meets standard airline carry-on size requirements.